SW-M150 wireless system is based on WHDI wireless technology, 5.1-5.9GHz license free bands, DFS comply, , supports uncompressed 3G/HD-SDI and HDMI (Max 1080p60) to transmit 150 meters (Line-of-Sight) distance, and less than 1 millisecond latency. The system is pure hardware connection, plug and play, which is widely used in director monitoring, drone, ropeway camera, steadicam etc. In Line-of-Sight, SW-M150 supports non-compressed 3G/HD-SDI and HDMI 150 meters (500 feet) transmission, with less than 1 millisecond latency. SW-M150 supports SDI & HDMI embedded audio (CH1&2) transmission, and supports SDI Timecode & Trigger transmission. Both Tx and Rx are equipped with OLED to display signal format, wireless channel number and signal strength. On the Tx, push the joystick up/down to switch wireless channels from CH0 to CH10, and indicates the signal bars. When changing to a new channel, the paired Rx will follow the new channel automatically. On the Rx, push the joystick right to enter wireless condition analysis, and after 10 seconds, the OLED will display the signal strength of all 11 wireless channels, and helps to select a best channel to work. Support 3-4 pairs wireless channels to work together in one location. The Transmitter and Receiver need to pair and work encrypted. Supports Max 1 to 4 multicast. Any unpaired receivers can’t been connected with theTransmitter, in order to protect the camera footages. Some of the cine cameras like Alexa Mini, Red Raven, when operate playback on the camera, the output SDI clock was interrupted and will break the wireless video transmission. 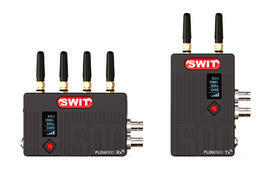 SW-M series provide the “Instant Playback” mode, to support the constant wireless video receiving. On the Tx, push the joystick right to enter menu, and set “InsPB” to “ON”, to switch on the “Instant Playback” Mode. Due to the wireless chip limitation, the normal wireless systems cannot truely reproduce colors. SW-M series made particular algorithm modifications, to ensure a broadcast level accurate color reproduction. Both Tx and Rx provide 7-34V 2-pin lockable DC input. The Rx can be selected from V-mount (Default) and Gold mount battery plates. The SW-M150 Tx and Rx are already paired in factory. You can directly use. (1) Power on the Tx and connect SDI or HDMI source to Tx. (3) Press down and hold the Rx Joystick, till the Rx OLED displays “PAIR” (Pic 2). In the meantime, the monitor will display “PLEASE PRESS REGISTRATION BUTTON ON CAMERA UNIT” (Pic 3). Then release the Rx button. (4) Press down and hold the Tx Joystick, till the Tx OLED displays “PAIR” (Pic 2). In the meantime, the monitor will display “REGISTRATION IN PROGRESS” (Pic 4), Then release the Tx button. (5) When progress bar finished, the Tx and Rx are paired successfully, the system is working under encryption. (1) Set the Transmitter and Receiver antennas straight up, even if they are laid down installed. (2) Set the Receiver as high as possible.